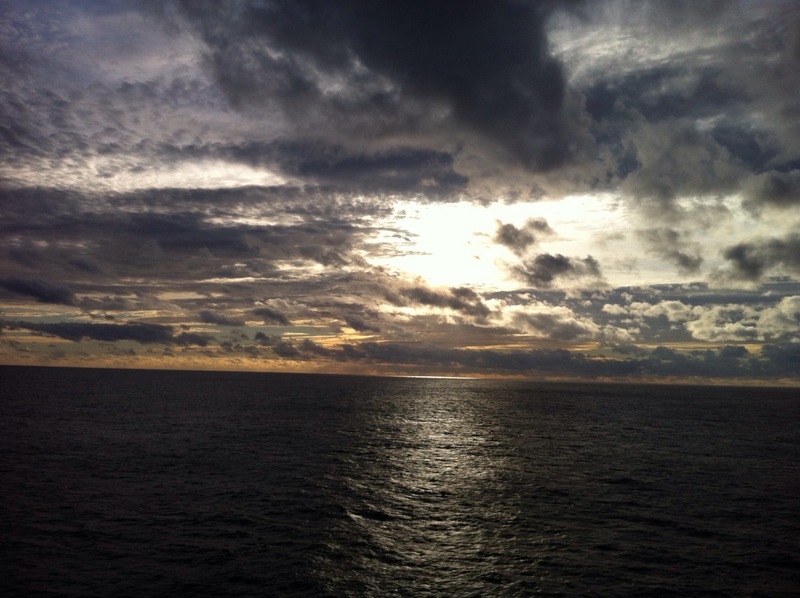 After we left Santa Cruz de Tenerife we had five days ahead of us crossing the Atlantic Ocean. 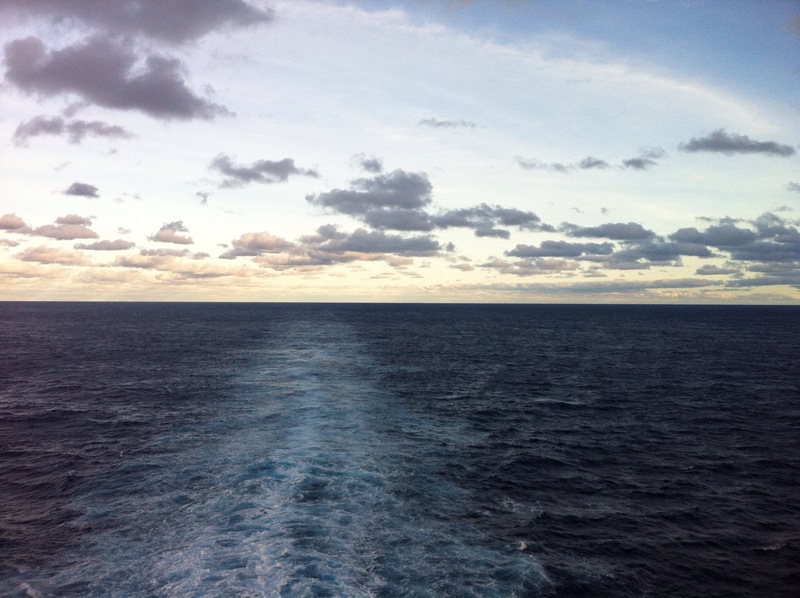 This was our second Atlantic crossing this year – the first one only took 8 hours though! We were quite looking forward to these five days at sea – we had stocked our kindles with books and downloaded some programs to watch on the laptop. I had visions of it being quite cold outside but that didn’t worry me given we were heading for the Caribbean – plenty of time for warm weather there. That first night on the boat after leaving Tenerife was pretty rough and we were rocked and rolled around in our bed for most of the night. We both woke up and I must admit it was a bit disconcerting – there were some quite loud noises as a result of the boat hitting the waves. 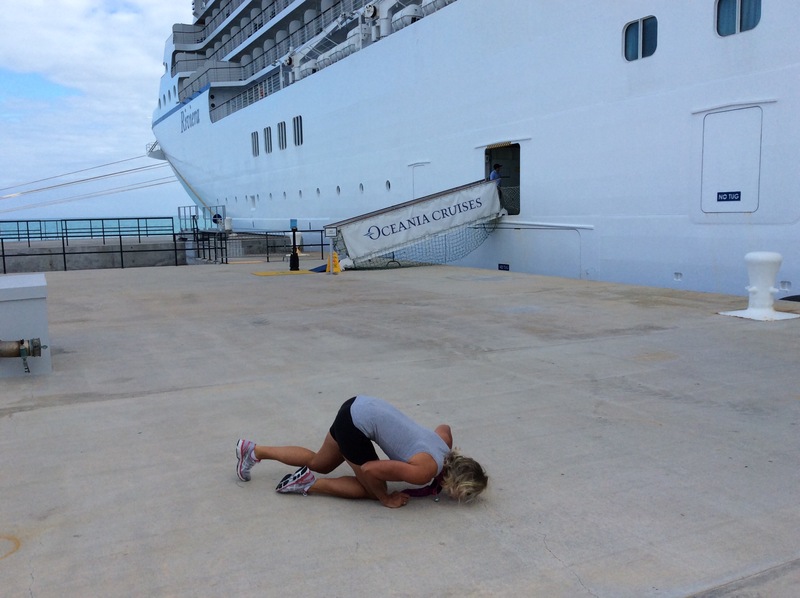 It wasn’t much better by the morning and there was no way I was in any state to go to the gym. I ended up ordering some yoghurt and fruit for breakfast which I ate at lunchtime and we stayed in bed all day. I felt rather ill and bought that breakfast up late afternoon! Steve hadn’t eaten all day so we went down to get some dinner and spoke to some of the crew and other passengers – apparently it had been a very quiet day on the ship. We got some sea sickness tablets from reception and they worked instantaneously. Day two wasn’t quite as bad and we managed to get out and about. Day three was a beautiful day with the temperature reaching 27 degrees so we spent the day on the deck. Steve played a few games of table tennis with his new found friends. I enjoyed the sunshine and topped up my tan. I even hopped in the pool which was mirroring the ocean – the water was whooshing in and out of the pool and causing mini waves – good fun. Day four had gone downhill again but wasn’t as bad as day one thank goodness. We have only seen one other boat over the past five days and it was a freighter. The Captain of the ship did a Q & A session and one of the questions he was asked was about other ships on this route. Although this is the most travelled ocean (see below) he said on their radar they only picked up four other ships during this five days – this particular passage is mainly used by passenger ships and is not particularly busy. Today is the end of day five and I am pleased to say it was sunny and calm again. The tan got another boost and Steve has spent most of the day playing table tennis with the old fullas. One more night and we can say we survived – not sure if I would rush to cross the Atlantic by boat again but all’s well that ends well. To celebrate our impending survival Steve decided we should have a bottle of the champagne we bought on board. 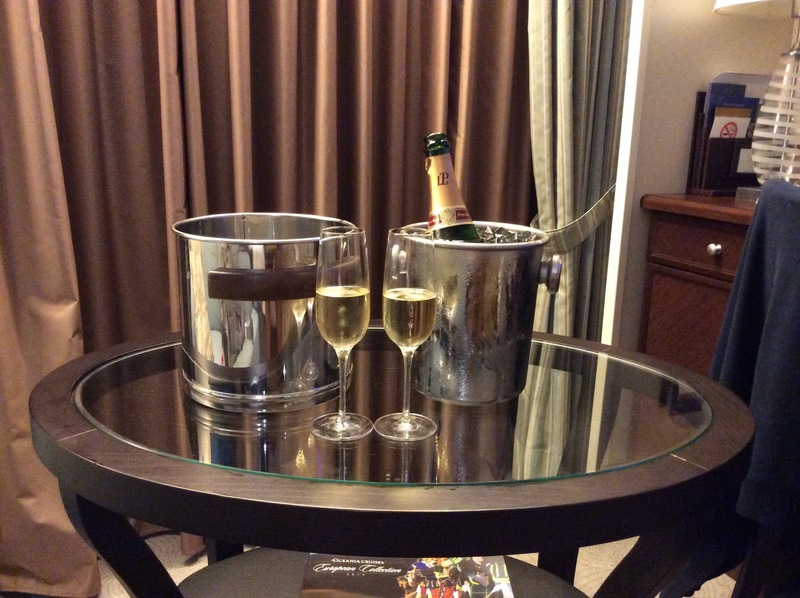 He called room service and asked for some champagne glasses and ice. They turned up with the glasses and asked for our ice bucket so they could fill it up. Steve goes into the bathroom and gets what he is convinced is the ice bucket – I’m telling him the ice bucket is out in the main cabin by the fridge and he is saying no, no it is in here. He comes out of the bathroom with the stainless steel rubbish bin. What a donut! 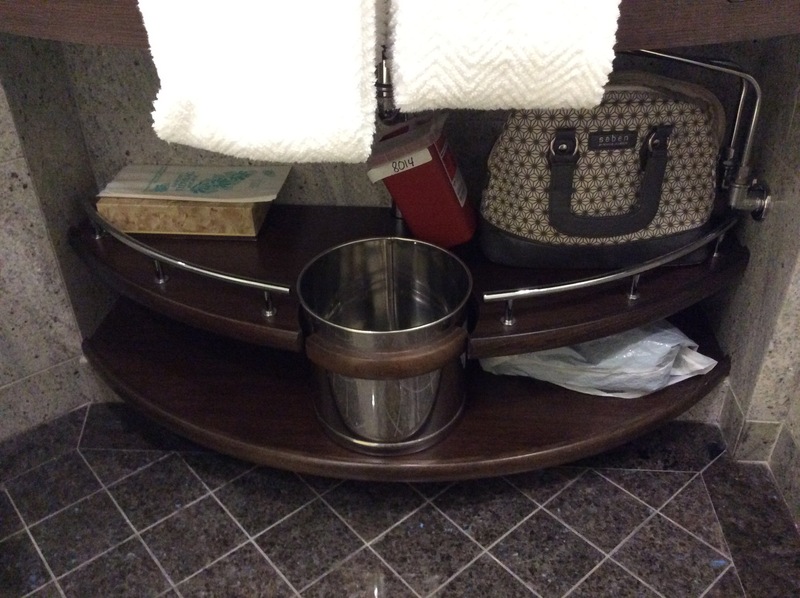 He thought it was quite a clever design feature – building the ice bucket into the bathroom. He really does think outside the square doesn’t he? The Atlantic Ocean, the second largest of the earth’s four oceans is the most heavily travelled. Only the Pacific Ocean is larger covering about twice the area of the Atlantic Ocean. The Atlantic is divided into two nominal sections – the North Atlantic which is north of the equator and the South Atlantic which is south of the equator. The ocean’s name is derived from Atlas, one of the Titans of Greek mythology. The Atlantic Ocean is essentially an S shaped north-south channel, extending from the Arctic Ocean in the north to the Antarctic continent in the south and situated between the eastern coast of the American continents and the western coasts of Europe and Africa. 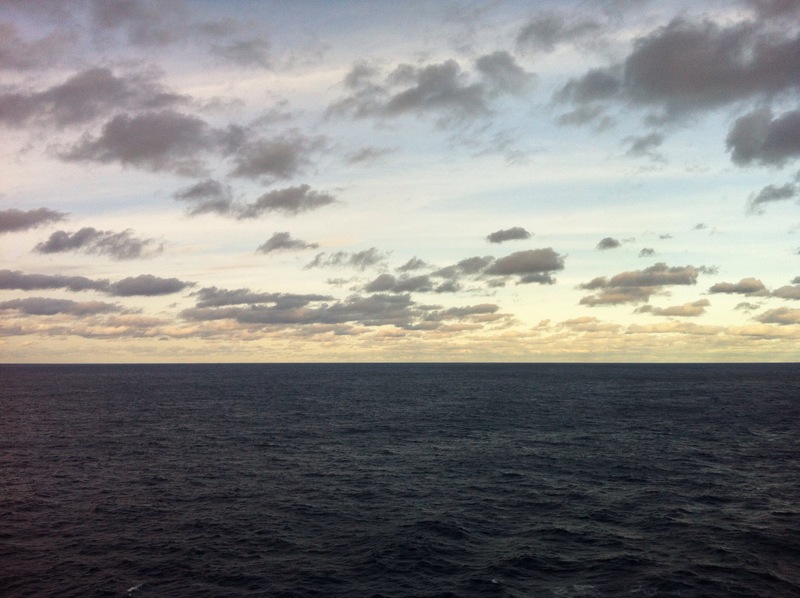 The Atlantic Ocean proper has a surface area of about 82 million square kilometres. Including it’s marginal seas – the Gulf of Mexico, the Caribbean Sea, the Arctic Ocean, and the North, Baltic, Mediterranean and Black seas the total area is about 106 million square kilometres. The Atlantic Ocean contains some of the world’s most productive fisheries, located on the continental shelves and marine ridges of the British Isles, Iceland, Canada (especially the Grand Banks off Newfoundland), and the northeastern United States. Herring, anchovy, sardines, cod, flounder and perch are the most commercial species. Tuna is taken off northwestern Africa and northeastern South America in increasing numbers. The unit catch per unit area is much higher in the Atlantic than in other oceans. Actively mined mineral resources in the Atlantic include titanium, zircon, and monazite (phosphates of the cerium metals), off the eastern coast of Florida, and tin and iron ore, off the equatorial coast of Africa. The continental shelves and slopes of the Atlantic are potentially very rich in fossil fuels. Large amounts of petroleum are already being extracted in the North Sea and in the Caribbean Sea and Gulf of Mexico region; lesser amounts are extracted off the coast of Africa in the Gulf of Guinea.